Before fixing a new chain onto a chainsaw, you will definitely have to ascertain its dimensions, first and foremost. This is absolutely crucial to see to it that the chain fits the teeth, configurations, and overall dimensions of the chainsaw guide bar. This being the case, it is necessary that you acquaint yourself with the correct procedures for identifying and measuring these chains. Read on the rest of the article to find out how to do just that. You will receive the insight you require for a better outcome. Commence the exercise by measuring the chainsaw bar. This is the distance between the tips of the bar to the point at which it first appears from the rest of the casing of the chainsaw. Use a tape measure to do this job. After you have obtained this measurement, round it off to the nearest even number irrespective of whether or not it was fractional or odd. Now move on to measure the chain itself. To do this, stretch the chain completely flat on a surface. Search for the drive links of the chain. Typically, these links project from the chain underside. Get hold of the drive cog which powers the chain. Count the number of the drive links which exist on the chain. After this, proceed to determine the pitch of the chain. 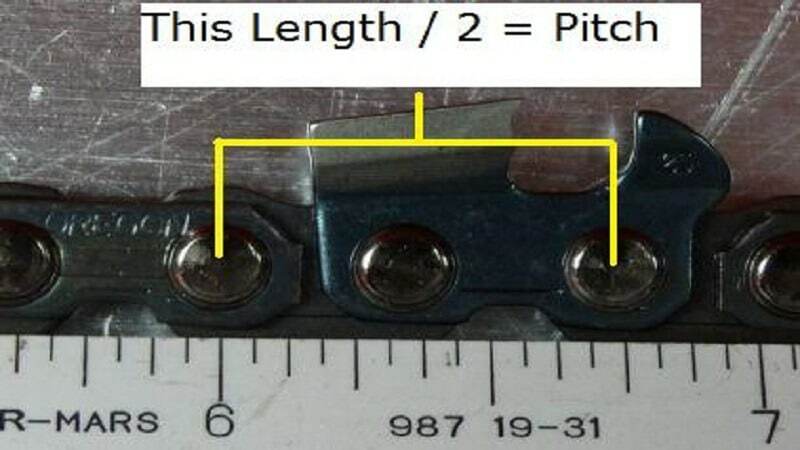 Take the measurements of the distance between any three consecutive rivets which hold the chain assembly intact. Take the measurement of the distance between the center points of one rivet to that of the third one. You will observe these rivets between the drive links and the cutters on the chainsaw bar. Divide this measurement by two to arrive at the pitch. This pitch alongside the sum total of the drive links jointly describe the length of the chain while seeking a suitable replacement. Lastly, you have to determine the length of the chainsaw chain. To accomplish this role, examine the number of the drive links alongside the pitch numbers which you will have already determined in stage III above. The sum of these two parameters gives you the length you are looking for. It is this that you use while replacing the chain of the chainsaw. NB: Please note that the exact procedures might vary slightly with the types of chainsaw chains. Even though identifying and measuring the chainsaw chain is not too complex a task, it nonetheless requires a great deal of attentiveness to details. Perhaps the best way to beat the system is to carry out regular practices. That way you will be able to master the expertise needed to do a better job and faster also for that matter. You now have what it takes to do a better job. You only need to master some confidence to do a satisfactory task ahead. We wish you well!